Papua's tropical forests are very strategic in terms of the global climate as well as providing timber and other forest products, which need to be managed sustainably. To implement REDD in Papua, the forestry sector has the duty to rehabilitate degraded forests and lands and to manage forests well. If we manage conservation and protected areas, and production forests properly, and stop converting forests to other uses, we can reduce CO2 emissions and help balance the global climate. However, the reality is, the Indonesian government is not concerned about the state of the climate. In Papua province, there are pilot projects planned in Jayapura district, including in the Cycloop Nature Reserve, the Mosoali Forest Area and the Unurum Guay forest area. In West Papua province, they are planned in Kaimana district, covering Arguni Bay, Triton Bay and Yamor Lake. However the region’s different land use areas – under its spatial plan – have not been clearly established, and indigenous peoples themselves know nothing about government plans to determine their customary areas in line with what’s needed for REDD. One carbon trading pilot project was initiated in 2008 by the provincial government of West Papua and Carbon Strategic International (CSI, Australia). It is located in forest areas in eight districts, with a total area of 8 million ha. The government’s share is 80% and CSI’s is 20%, with half of this for the company and half to pay experts. The division of the government’s share between central government, region and community still has to be decided. It is thought that carbon absorption is 300-350 tonnes per hectare and each tonne will generate 10-16 USD. The price and income will be calculated annually based on financial developments and inflation. There is now a new agreement between the West Papua provincial government and Asia Pacific Carbon (of Australia). REDD locations in West Papua are in protected forests. These were selected because of the high level of threat they face due to urban expansion, plus mining such as coal, copper and gold, and other interests. The conversion of forests in West Papua for economic growth is increasing: there are plans to develop oil palm plantations, sago, mining, transmigration and so on. This is evident from the increase in the number of companies wanting to carry out environmental impacts assessments for such projects. BPKH (the Forest Area Mapping Agency of the Forestry Service) is currently making a map of forest management units (KPH) in West Papua and Manokwari district. It is hoped that this map will be a tool for the carbon trade, to find potential locations and will support the calculation of carbon produced. REDD in Indonesia has been described as a national approach to be implemented at sub-national level. This means the overarching policy and incentive framework comes from the central government and the details for implementation rest with the provinces and/or regional government and related stakeholders. Papuan regional legislation, which provides the legal framework for implementing REDD in Papua, recognises rights and customary forests and emphasises community-based forest management. Using provincial regulations and guidance from the decisions made by the forestry ministry on REDD, the Papuan government – supported by civil society, universities, indigenous communities and other key actors – planned to establish a Forest Carbon (REDD) Papua Task Force. This Task Force was appointed by governor’s decree at the beginning of 2011. The group’s aim is to assist the Papuan government to translate, develop and coordinate policy approaches and positive incentives coming from the national and international levels, for the provincial level and main districts involved. In practice, local community involvement is limited and the project is not in line with community interests. There is still very little knowledge and technical capacity among local government officers and related government agencies, CSOs - let alone communities living in West Papua province - about climate change and the carbon trade. There is little knowledge about national policies, international commitments on climate change, best practice for forest management, carbon trade mechanisms, the logging moratorium, schemes to reduce forest destruction and reduce emissions, and their benefits and impacts. There have been several meetings to discuss the carbon trade, but no follow-up, and no sign of policies or programmes by the provincial and district governments to implement it. These meetings are still very limited in that they do not involve civil society, local peoples organisations such as DAP [Dewan Adat Papua – Papuan Customary Council], LMA [Lembaga Masyarakat Adat – Indigenous Peoples’ Council] or the MRP [Majelis Rakyat Papua – Papuan Peoples Assembly], NGOs or community representatives in West Papua. This lack of involvement, it is feared, will give rise to negative impacts in planning and implementing programmes. The TGHK [Tata Guna Hutan Sepekatan – agreed forest use] map and delineation of forest boundaries still does not exist and there is no clear discussion about it, due to the tussle between interests and concepts of state land and customary land. The draft spatial plan for West Papua province and for Manokwari district does not exist and hasn’t been discussed. The main people who hold rights over the target of REDD+ (land, forest and peat ) do not understand and are not adequately involved in reaching a consensus at national and local level, to determine the preparations for implementing REDD+. This is what happened with the carbon trading project initiated by the West Papua provincial government and CSI. Max. J. Tokede from UNIPA Manokwari explained what needs to be done to prepare for REDD as follows: first, increase monitoring capacity to detect changes in carbon storage in Papua and West Papua provinces. This consists of: remote sensing (satellite imaging); monitoring from the air; community-based monitoring on the ground; support for activities to monitor forests and timber trade by the Forestry Service and communities. Second, pilot activities for fair incentives to protect the forest, including spatial planning and changes in forest function, mapping indigenous communities’ forests in pilot locations; building village institutions to manage incentive payments to prevent deforestation and create alternatives for income generation; building capacity for certified sustainable community logging, and developing participatory monitoring and protection systems. Meanwhile, the REDD funding mechanism in Papua needs, among other things, to cover funding support for community development by opening village accounts; funding support for groups or individuals for community-based forest patrols and protection with group/individual accounts; and a savings and loan fund to develop small and medium businesses in villages. There also needs to be capacity at regional government level to facilitate funding for project management, funding for carbon monitoring and law enforcement, and funding for general community development (education/health/economic development). There also needs to be Technical Assistance to enable REDD to run smoothly. The real question is, will any benefits reach Indigenous Peoples who hold full rights over their forests? Will the Indonesian government say indigenous peoples who are set up as a legal entity will still be able to access natural resources in forests, as long as they don’t cut trees, and will be able to profit from REDD? There are clearly still questions to be answered about setting up as a legal entity for indigenous communities: what about those who don’t have this legal status? If indigenous peoples can acquire this status, how do they go about it? It will be no easy process, no matter how straightforward it might appear. In this context, the state must first of all recognise the existence of indigenous peoples. Industrialised countries like the EU nations, Japan, USA and Norway are ready to fund REDD projects. Some of the schemes will pay USD10 per tonne of carbon. However, will the indigenous peoples of Papua benefit from these grants? It is not yet certain. Protecting forests for the future, or managing them sustainably has been something generations of indigenous peoples have known about. There are sacred forests or taboo places within forests which are still integral to indigenous people’s lives. Now the modern world knows these sacred forests as conservation forests. The way forests are used by indigenous peoples guarantees conservation and sustainability. They use simple technology and take only what they need for daily needs. Director of the NGO PERDU Manokwari, Mujianto, explains that based on a study by PERDU in Kaimana district – an area which has been scoped and nominated by the West Papua provincial government as a REDD and carbon trade project area - government permits are still mostly given to entrepreneurs and companies. Post OHL II [OHL II is the second police operation against illegal logging], there are practically no licences for local communities, Kopermas [the state-sanctioned community cooperatives] aren’t functioning, although local people do use cut timber in very limited volumes to take advantage of local markets available. The likelihood of the natural forests disappearing will increase as capital flows into this area for investment in various natural resources sectors (plantations, mining etc). “Meanwhile, if we look back into the past… for generations local people’s livelihoods have depended on natural resources, including forest resources; forest management and use was done using simple methods based on local knowledge; fresh water needs, animal protein and ingredients for food and medicines, building materials were taken from their forest areas. Forest exploitation is still limited to supplying household needs and does not need destructive technology. In this case, forest-dwelling indigenous peoples are far more expert in safeguarding the forests for REDD projects. But if forests are turned into oxygen or carbon trading business, then local people have to be directly and fully involved, including in getting cash compensation”, according to Muji. REDD projects and other initiatives keep being rolled out but there is no sign that inadequate policies will be amended or the low level of political commitment shown by decision-makers and project initiators will be improved to project community rights. This is leading to fears that there will be distortions and conflicts of interests, that social conflict will spread, and that, in turn, the environment will not be protected, and GHG emissions will continue to rise, while communities become increasingly impoverished. 2) increase community capacity for involvement in monitoring all stages of provincial REDD+ pilot projects and other REDD+ projects at district level and for involvement in corrective actions. A new study by FPP, Pusaka and JASOIL found that none of the several REDD+ schemes which have been proposed for Papua have progressed beyond the early planning stage. Only one REDD project in Papua is identified on the REDD-Indonesia website (linked to Indonesia’s Forestry Department). The project, called “Perpetual Finance for Carbon Benefits” is in Papua province, with New Forest Asset Management/PT Emerald Planet named as the organisations involved. According to FPP/Pusaka/JASOIL, these companies signed a Memorandum of Understanding with Papua’s governor in 2008 to develop plans to reduce emissions from deforestation in 265,000 hectares of forests in Mamberamo and Mimika, but the developers were unable to obtain all the required permits. Under a partnership with Eco-Carbone, called Eco-Emerald, the company also claims to be developing “community-based jatophra plantations on degraded land in Indonesia” (it is not stated whether this is in Papua or elsewhere in Indonesia). Carbon Strategic Internationalis a global environmental (carbon, biodiversity) investment and trading group. Its website says that the company works with corporations, governments and communities “to help them understand and leverage the rapidly growing environmental, energy and financial markets to create positive and sustainable economic, social and ecological outcomes.” The companies’ four main operations are described as Origination, Advisory & Finance, Trading and Asset Management.It has an office in Jakarta, but there is no specific information about Papua (or even Indonesia) on its website. Asia Pacific Carbon has been involved in carbon project development since 2005, starting in the rainforests of Papua New Guinea (PNG). Its current focus on Indonesia and PNG. The company claims to be “one of the leading high quality carbon development companies in the Asia and Pacific region”. It has offices in Australia, Singapore, Indonesia and Papua New Guinea. On its website, the company further states that it works with highly experienced projects developers, technology partners, financial institutions and trading groups” and is “further supported by our close working relationships with project owners, governments, statutory bodies, tertiary institutions and NGOs in each of our target markets. An earlier attempt to gain access to carbon projects in Papua was launched by Carbon Conservation, an Australia-based company run by entrepreneur Dorjee Sun. 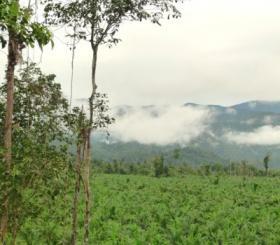 Carbon Conservation is involved in the Ulu Masen REDD project in Aceh. See Papua and West Papua: REDD+ and the threat to indigenous peoples, as above. See DTE 76-77, May 2008, for more background, at www.downtoearth-indonesia.org/old-site/76dde.htm.See also http://www.carbonconservation.com/.